Garden art is best described as turning miscellaneous pieces of glass, ceramic, wine bottles, pressed glass, sea glass and metal into an indoor or outdoor sculpture. The real challenge is in building the sculpture with different pieces that were never designed to go together in the first place. Avoid tangent and point contact between pieces – make sure there is flat to flat contact between components – the more the better. A roughened surface (abraded or sand blasted) will improve performance of the adhesive bond. Avoid cantilevered designs that put the adhesive joint in cleavage or peel. If the design is outdoors, the glue joints chosen should shed water rather than hold water. As we mentioned in our most recent blog entry, “Surface Concerns: Anything But Superficial” – cleanliness is really important. Be sure to clean all components with isopropyl alcohol and make sure the surface is dry before applying adhesive. Be sure you don’t move components prior to hard fixturing as this will compromise performance. Wherever possible, apply adhesive in a horizontal position and fixture in the same position. Flatten rounded edges that will receive adhesive – use a belt sander or silicon carbide paper – and always clean after sanding. Dremel® type tools can also be used to roughen surfaces. Attention to detail is important – don’t skip steps in part preparation and fixturing. Establish fixture time using the materials you plan to use to build the structure. To determine how long it takes to cure, use the “Rule of 5”: once there is fixture between the pieces, continue to hold the light source on the area for 5 times the amount of time it took you to achieve that initial fixture. Remember, longer is better and won’t affect performance as long as you aren’t using a high powered lamp. 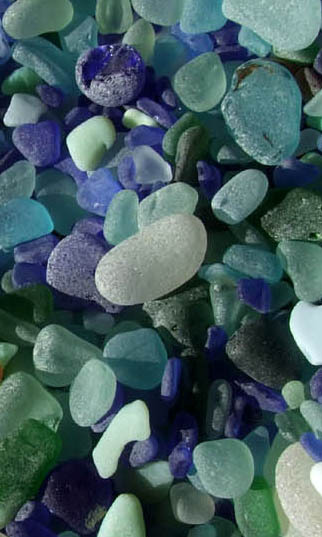 For colored glass, make sure the glass doesn’t block the light energy needed to cure the adhesive. Take the time to frequently make sure your light source is properly functioning – establish a benchmark fixture test and use it on a regular basis to validate cure times. Most adhesives are mild skin sensitizers, so be sure to throw away used gloves. Adhesives have an odor, so work in a well-ventilated area. Never look at a UV light source without wearing protective eyewear. Please feel free to contact us at any point if you have questions about handling these materials and remember: the only stupid question is the one that isn’t asked. When it comes to bonding with friends and family, sometimes it’s best (or even necessary) to overlook what’s on the surface, and focus on invisible qualities within. When bonding glass and other materials what’s on the surface is absolutely critical — even if it looks as though there’s nothing there. In particular, invisible oils on materials can hinder glue’s ability to form a strong and lasting attachment between parts in a project. These oils can come from a variety of sources, but two chief culprits are equipment used in manufacturing processes and human fingers. Anyone who touches a piece of glass, metal, or ceramic (including you) leaves a small amount of oil residue behind. This may be obvious — in the case of smudgy fingerprints, but more often it’s not noticeable. Yet the oil is hiding there, ready to weaken your gluing job. Ridding your project of these oils is quick and easy, but many artisans are so eager to get gluing that they skip the simple surface-prep process and charge ahead — a decision that can limit the effectiveness of glue joints in their projects. So what’s the secret to oil-free gluing surfaces? All you need is gloves and an alcohol wipe or two. 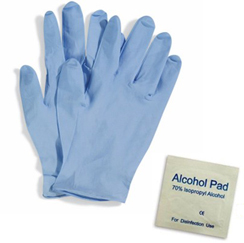 First, slip on a pair of disposable nitrile, latex, or polyethylene gloves. * Nitrile and latex generally stretch-fits to your fingers better, for better tactile sense. Polyethylene fits a bit less snugly, but works well for those with latex allergies. Most importantly, all types of gloves prevent your skin oils from transferring to your work materials. Then, while sporting your gloves, use an isopropyl alcohol wipe to clean all surfaces that you intend to glue. Wipe in one direction and allow the alcohol to evaporate before applying any glue. You’ll have clean, oil-free contact between the glue and your materials, and that’ll mean a strong, durable bond. * CLK Associates supplies a complimentary pair of nitrile gloves with each glue shipment. In addition to keeping your project components oil-free, they also prevent possible “sunburn” from exposure to UV curing lights. Welcome to our new CLK Associates Blog. We are excited to share information, tips, ideas and everything meaningful to help you with bonding your glass, metal, crystal or wood project. If you are an Artist looking for a way to attach glass, or a Craftsman in need of a UV Curing adhesive, or even a Homeowner looking for an adhesive to fix a valuable piece, we would love to help. Assembly techniques for consideration when using adhesives. Regardless of the adhesive chosen there are some basic steps in project design, part preparation, and adhesive application and cure to insure a long lived project. Overview – Adhesives are another tool available to help make the assembly of materials easier. However, to get the maximum benefit from their use you must play to their strengths. For the following discussion the adhesive is assumed to be OK. The adhesive is only as good as what it is stuck to. Surface cleanliness is a must. Make sure the components are the same each time – substituting materials or a change in supplier needs to be re-evaluated – do not assume they are the same. Hand fixturing induces lots of variability in the ultimate performance – simple fixturing and clamping will eliminate a major variation in performance. Once the adhesive has been applied, the parts assembled and fixtured don’t handle or try to readjust things – most adhesives, regardless of how quick they set (with the exception of uv cure materials) continue to develop strength for several days – this includes super glues, 5 minute epoxies, etc. Make sure you do not compromise performance if you need to handle parts soon after assembly. Find out more at our site, www.clk-llc.com.